Our banquet halls are flexible spaces that can be transformed to support any theme you’ve chosen for your event. Whether you’re planning a banquet for a corporate event or you’re planning a once-in-a-lifetime, special occasion such as a wedding, our banquet facilities are a great place to host your upcoming event. Everyone that worked on the event was engaged, polite, and professional. Spooky Nook Sports isn’t just the largest indoor sports complex in the United States. Our campus is also a premier location that’s regularly chosen to host business meetings and private events of all sizes. 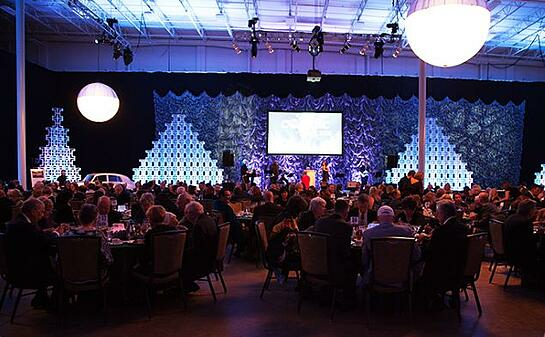 We have 700,000 square feet of event space and our banquet halls can accommodate up to 10,000 guests at once. Whether thousands of people are going to attend your banquet or just 20 people are expected, we can customize a space for your group. If you’re going to give a presentation during your banquet, you’ll enjoy access to professional-grade audio, video and lighting equipment set up by experts in their field. Your guests will also have access to free Wi-Fi while they’re at our location. This means they’ll be able to share quotes and images from your presentation using their social media accounts, which will increase the reach and impact of your presentation. The focus of just about any banquet is the food that’s served. When you book one of our banquet halls, you’ll be able to choose from many available catering options. Our executive chef and banquet staff will work with you to select a menu that will wow your guests. We use locally-sourced, fresh ingredients to prepare the food we serve, regardless of whether you want a buffet or a plated meal. We know hosting a banquet is a big deal, which is why we’ll welcome your guests warmly when they arrive for your event. From the moment your guests park in our generously sized parking area, they’ll feel right at home at Spooky Nook Sports because our staff will cater to their every need. When you book our banquet facilities, your guests become our guests and we’ll do everything possible to make sure they have a pleasant experience. In addition to the many fitness areas available at Spooky Nook Sports, we have a hotel on our campus. With 135 comfortable rooms and suites, The Warehouse Hotel is the ideal place for you and your guests to unwind after your banquet. We know banquets are sometimes one-off events or they’re part of an event that spans several days, such as a trade show. Whether your upcoming banquet is a standalone event or it’s part of a larger series of events, we can accommodate you and your group. Make a reservation for our banquet rooms conveniently located near Harrisburg, Hershey, Lebanon and Lancaster, PA.